A stethoscope is a medical instrument used to listen to sounds produced in the body, especially those that emanate from the heart and lungs. Most modern stethoscopes are binaural; that is, the instrument is intended for use with both ears. Stethoscopes comprise two flexible rubber tubes running from a valve to the earpieces. The valve also connects the tubes to the chestpiece, which can be either a bell-shaped piece to pick up low sounds or a flat disk for higher frequencies. The stethoscope is used mainly for the detection of heart murmurs, irregular heart rhythms, or abnormal heart sounds. It is also used to listen to the sound of air moving through the lungs in order to detect abnormalities in the air tubes and sacs found in the lung walls. The universally acknowledged inventor of the stethoscope is Rene-Theophile-Hyacinthe Laennec, who, finding it difficult to listen to a patient's heartbeat unaided, rolled up a cylinder of paper, thereby amplifying the sound. Laennec had noticed, as others such as Leonardo da Vinci had before him, that sound becomes amplified to the human ear as it passes through wood. He observed children holding a piece of wood to their ears and scratching the other end. The wood increased the sound of the scratching. In 1819, Laennec provided physicians with what he originally called a baton, a hollow cylinder made from wood (walnut or such light woods as fir or boxwood) perhaps as short as 5.9 inches (15 centimeters) in length. The bore was shaped like a trumpet, but for listening to the heart, a stopper could be inserted to make the bore merely cylindrical. The first true stethoscopes (based on Laennec 's "baton") were made of wood (usually cedar or pine) tubes that ranged in shape from cylinder- to goblet- or hourglass-shaped. The lengths ranged from 5.90 to 8.86 inches (15 to 22.5 centimeters). Unlike those of today, these stethoscopes were monaural; that is, they were held to one ear and had no ear plugs. This type of stethoscope is still used in some places in Europe. Stethoscopes of varying materials (such as hard rubber or aluminum) were common during the mid-nineteenth century. A few telescoped to provide a stethoscope of varying length. The first innovation was not at first applied to the stethoscope, but to conversation tubes and hearing aids produced by many manufacturers in the late 1800s. These items were at first horn-shaped, yet eventually included earplugs connected to rubber tubes. Designers of stethoscopes adapted such devices, and the stethoscope of the time consisted of an earplug, a flexible rubber tube, and a bell-shaped chestpiece. Despite its short-comings in the conductance of all chest sounds equally, this early stethoscope was commended for its convenient shape and flexibility. Binaural stethoscopes increased in popularity fairly rapidly. As early as 1829 a trumpet-shaped mahogany chestpiece was screwed into a joint from which two lead pipes led to the ears. The device, invented by medical student Nicholas P. Comins, was deemed flexible (despite the rigidity of the wooden and metallic parts), because unlike the earlier monaural stethoscopes, it had movable parts. The aluminum chestpiece is die cast into an approximation of its round shape before being machined to its exact form. The flexible tubing, which can be made of polyvinyl chloride or latex rubber, is extruded into shape. was improved slightly in 1851 by Arthur Leared of Dublin. The main problem with many early designs was the inferior earpieces that provided muffled sound. George Cammann of New York perfected the nineteenth century stethoscope in 1852. His instrument, considered to be the best of the time, had ivory or ebony knobs as earpieces, and these had springs attached to hold them more securely in the ear. The tubes were made of coils of wires sandwiched between rubber that was then coated with silk or cotton. The chestpiece was surrounded by a ring of rubber, creating a suction cup that more easily adhered to the skin. Another type of stethoscope was developed in 1859. Designed by Scott Alison, the differential stethoscope had two separate chestpieces, allowing the user to hear and compare sounds in two different places. This stethoscope also allowed the physician to better pinpoint the source of the sound through the natural process of triangulation our ears normally use to discover the direction of sounds. The first electronic stethoscopes became available as early as the 1890s; by 1902, Albert Abrams developed a truly useable one. With it, he was able to amplify the sounds made by the heart. By applying resistance gradually to the circuit, he could eliminate certain sounds, thereby differentiating between the heart's muscular and valvular movements. Although the stethoscope is a simple device, it is typical for its metal parts and plastic parts to be manufactured at separate locations, and for the entire device to be assembled at yet another location. It is also common for inexpensive models to be sold disassembled. from a wide range of choices, and that consumers can purchase stethoscopes for home use. 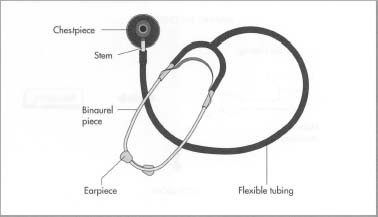 A binaural stethoscope consists of earplugs, binaural pieces, flexible tubing, a stem, and a chestpiece. The earplugs are attached to springs made of steel so that they fit firmly in the ears, while the earplugs themselves are made from either Delrin (a trademark plastic that is white, rigid, and similar to nylon) or softer molded silicone rubber. The binaural pieces that run from the earplugs to the flexible tubing, the stem that runs from the flexible tubing to the chestpiece, and the chestpiece itself are made from metal (aluminum, chrome-plated brass, or stainless steel). The flexible tubing is either polyvinyl chloride or latex rubber. The stem for stethoscopes with dual diaphragms has a valve with a steel ball bearing and a steel spring inside. This type of stethoscope can switch from a flat diaphragm to a cupped one when turned by shifting the ball bearing to cover up the pathway to the diaphragm that is not in use. The flat diaphragm is formed from a flat, thin, rigid plastic disk that can be Bakelite, an epoxy-fiberglass compound, or other suitable plastic. Today, most stethoscopes have an anti-chill ring attached to both sides of the diaphragm. The anti-chill ring, besides being more comfortable for the patient, allows better suction and thus allows sounds to be heard more clearly. The rings are made from either silicone rubber or polyvinyl chloride. Although the stethoscope is a simple device, it is typical for its metal parts and plastic parts to be manufactured at separate locations, and for the entire device to be assembled at yet another location. It is also common for inexpensive models to be sold disassembled. Stethoscopes are rarely custom-made. If there is a large volume sold to one customer, the manufacturer can make a certain specified color or put the name of the hospital onto the stethoscopes. 1 Aluminum is typically die cast. 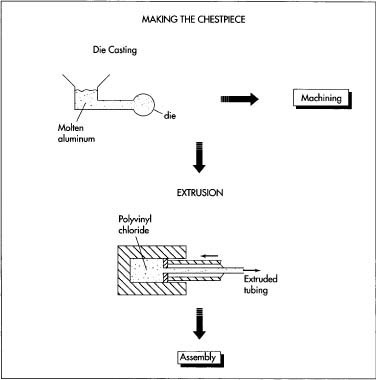 In this process, pressured molten aluminum is injected into molds, forming a slug in the form of a crude binaural piece or chestpiece. The slug is then machined to form its proper shape. Stainless steel arrives in huge rods that are machined on lathes using a semiautomatic process. Brass is also machined before being sent out for electroplating. The machining process consists of cutting excess metal from the slug or rod according to a plan that will yield a correctly shaped binaural piece or chestpiece. The binaural piece is then threaded at the top for the earplugs, and barbs are cut into the bottom to allow for the tubing connection. The chestpiece is also barbed at the top to allow for the connection. The metal springs are then connected and sealed to the binaural pieces. 2 More expensive stethoscopes have tubing that is "dipped." The binaural pieces are repeatedly dipped into a liquid latex until the tubes are of the correct thickness. Tubes intended for inexpensive or disassembled models are molded or extruded using standard methods. To attach the separate tubing, it is first heated by placing it in warm water; next, it is pushed onto the binaural pieces, wrapping snugly around the barbs. Another less-common method of attaching the tubing is to place the binaural pieces in a mold and then place the tubing around them to form a seal. 3 Stethoscopes are hand assembled. Once the binaural pieces have tubes, the diaphragm is placed in the chestpiece and sealed. Next, the anti-chill ring is put on both sides of the chestpiece. This can be done by cutting a recess in a circular track around the rim and slipping the ring inside. The preferred method is to stretch the ring around the rim of the diaphragm or bell, making a secure fit. The earplugs are then screwed on. 4 Inexpensive stethoscopes, which may be disassembled, are placed in bags and sealed. Mid-range stethoscopes are boxed. Quality stethoscopes are placed in sturdy boxes that have spaces die-cut in the packaging into which the stethoscope and accessories fit snugly. The stethoscopes are then placed in cases that hold 20 to 50 boxes each and shipped to medical supply dealers, or, if there is a large volume, directly to a hospital. The medical supply dealers then provide stethoscopes to private practice, hospitals, medical supply stores, and drug stores. A stethoscope must be able to pick up incredibly subtle, quiet sounds at such a level that a person of normal hearing can detect them using the instrument. Air leaks can decrease the volume of sound by as much as 10 to 15 decibels, as well as allow ambient noise to enter the stethoscope; therefore airtightness is imperative. Even inexpensive, disassembled stethoscopes available in drug stores easily disclose recognizable sounds (such as a heartbeat), while the highest quality instrument must meet tolerances of approximately 2.5 x 104 meters to ensure that all the pieces fit snugly and the junctions are airtight. Air leaks are almost inevitable, and are caused by cracking, punctures, weakness of metal, or pinhole formation during the manufacturing process. To detect any problems before shipping, the manufacturer places the stethoscopes in a machine that blows a steady stream of air through each instrument. There are also tug tests for stethoscopes. The instrument is placed on a machine that pulls at a certain level of force to check whether normal use will separate the pieces. All raw materials are also inspected, and each piece manufactured at a place other than the assembly plant is inspected for quality. Specific tolerances and procedures are checked at each step of the manufacturing and assembly process to see that the work is done correctly. The inspection consists of visually examining the stethoscope and testing the mechanical parts for proper fit and function. Every single assembled stethoscope is then checked to see if it is acoustically reliable. Nurses, doctors, and other health care professionals undergo extensive training in auscultation so that they can interpret the sounds they hear, though most might specialize in only one or a few types of readings. For instance, somebody listening to a patient breathe must know the sounds of a healthy lung system, as well as the sounds of each type of lung dysfunction so the patient can be diagnosed correctly. Maintenance and proper use of the stethoscope is just as important as the quality of manufacture. The stethoscope should be inspected periodically for air leaks and for defective parts that need replacing. To remove earwax and lint, the earplugs and chestpiece should be carefully wiped with rubbing alcohol, and the rest should be washed in mild, soapy water. If hospital procedure requires it, and the stethoscope can handle it, it should undergo standard sterilization procedures. Davis, Audrey B. Medicine and Its Technology. Greenwood Press, 1981. Reiser, Stanley Joel. Medicine and the Reign of Technology. Cambridge University Press, 1978. Bak, David J. "Stethoscope Allows Electronic Amplification," Design News. December 15, 1986, p. 50. Beaumont, Estelle. "For the Latest Word on Stethoscopes: Listen Here!" Nursing78. November, 1978, pp. 33-37. Jaffe, Joe. "Build This Doppler-Ultrasound Heart Monitor," Radio-Electronics. November, 1991, p. 49. Reiser, Stanley Joel. "The Medical Influence of the Stethoscope," Scientific American. February, 1979, pp. 148-156. Stone, John. "Cadence of the Heart," The New York Times Magazine. April 24, 1988, pp. 61-62.